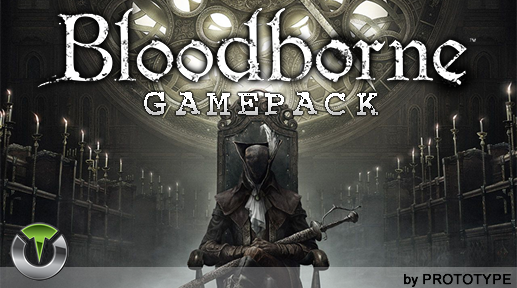 The Bloodborne Gamepack (by PROTOTYPE) for Titan One is your best companion to explore the word of Bloodborne and fight your way thru a path full of dangerous habitants. Featuring Fast Attack Auto Combo, Strong Attack Auto Combo, Reliable Jump Attack, Auto Evasion, Easy Pick, Easy Run, Easy Quit and Button Layout. Titan One Exclusive Feature: Bloodborne Gamepack. Adds combo sequence to the right fast attack (R1) action. A single tap on fast attack button will perform its original action. Hold down the button performs the combo sequence chosen. Adds combo sequence to the right strong attack (R2) action. A single tap on strong attack button will perform its original action. Hold down the button performs the combo sequence chosen. With this MOD enabled, L3 can be used for charge attack. Perform the Jump Attack action reliably by holding down the Use Item button plus Strong Attack for Jump Attack. The Use Item action is executed normally when the button is pressed and released quickly. Double tap or triple tap to roll repetitively as quickly as possible and without loose control of the camera. Hold down cross to quickly pick items on the ground and accelerate the scrolling of the dialogues. Hold down circle for 1s to activate the auto-hold and being able to control the camera while running or climb ladders. If activated a quick tap on PS button, or holding the Options Button, will execute the sequence to quit the game as fast as possible. With this MOD you can change the game controller layout. Swap L1 & R3 to lock target with L1 and transform weapons with R3; or use the God of War layout to use sprint, roll and jump without loose control of the camera. God of War Controller Layout.